The 9th and 10th of October are the last two opportunities to enjoy the extraordinary night openings of the Colosseum this year, suggested by the Soprintendenza. 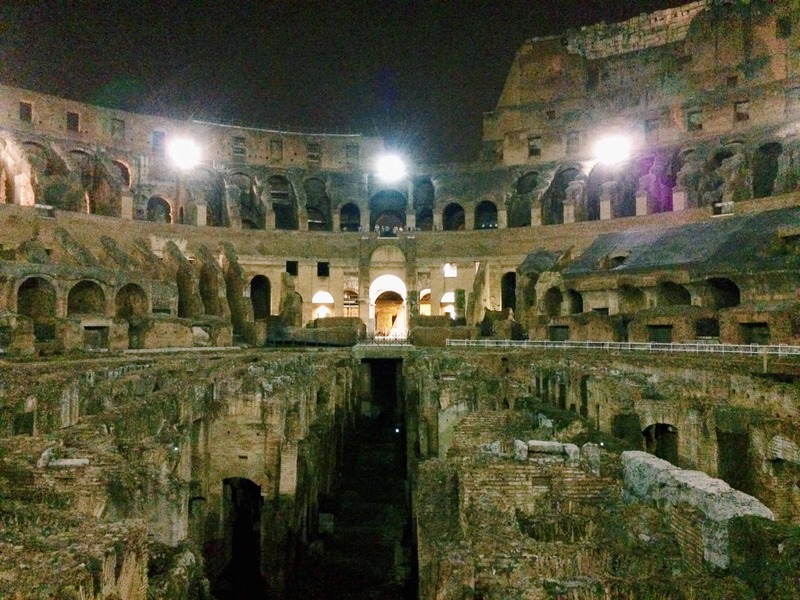 The special series of guided tours called The moon over the Colosseum (“La luna sul Colosseo”) offer the invaluable opportunity to discover the magic splendor of the Flavian amphitheater in the silent and dark evening hours. This experience reveals itself as truly touching as the shady and mysterious charm of the ancient monument will entrap you in a fascinating spectacle, letting you to live again the unique emotions felt by the travelers and artists right there, during the nights of past centuries. 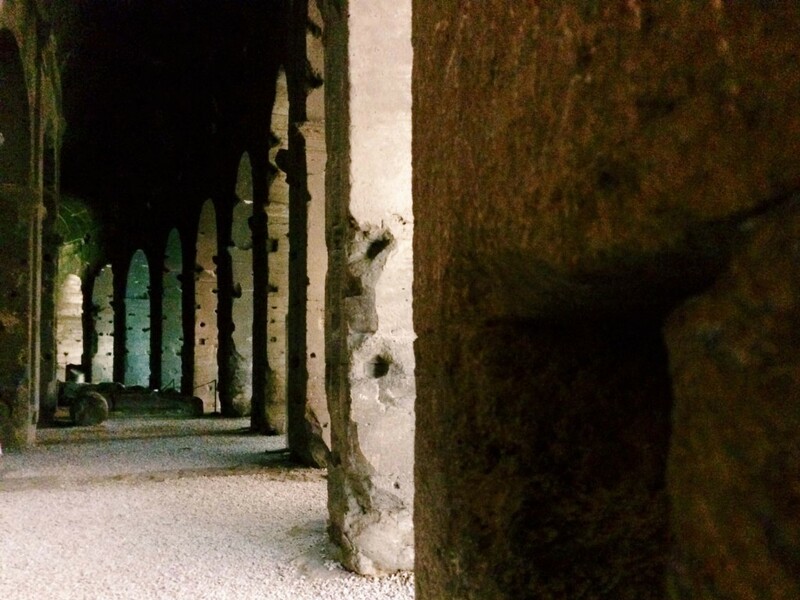 The entrance arcades at the Colosseum, Rome. 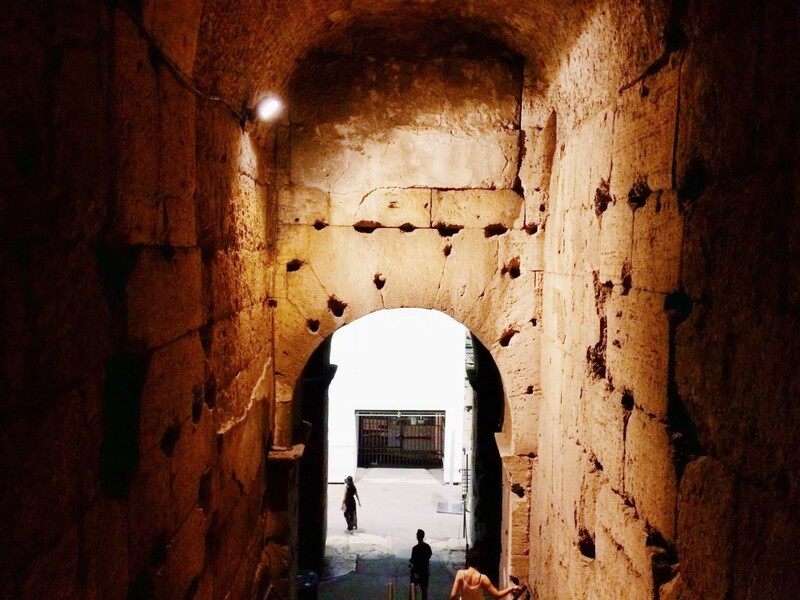 The adventurous path begins with the entrance to the Colosseum through the arcades at the first level and the emotion will rise till you’ll find yourself just at the heart of the largest amphitheater in the world. You’ll be able to walk on the little portion of the re-built arena on the eastern side (it was a wooden floor which was handily covered with sand, hence the Latin denomination), surrounded by the imposing remains of the cavea, once provided with copious rows that could approximately hold forty thousand spectators at least. And the silence of that moment will clash with the din of ancient times, when excited Romans attended there popular shows like munera (gladiatorial fights), venationes (either wild or exotic animal hunts), re-enactments of famous battles and even mock maritime ones called naumachiae. The interior of the Colosseum viewed from the arena. The floor of the arena originally covered the building structures that are now visible in the middle of the amphitheater. 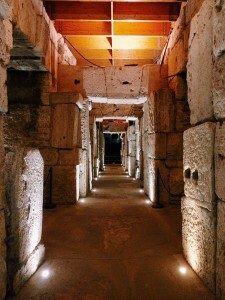 An underground corridor later made with travertine blocks. 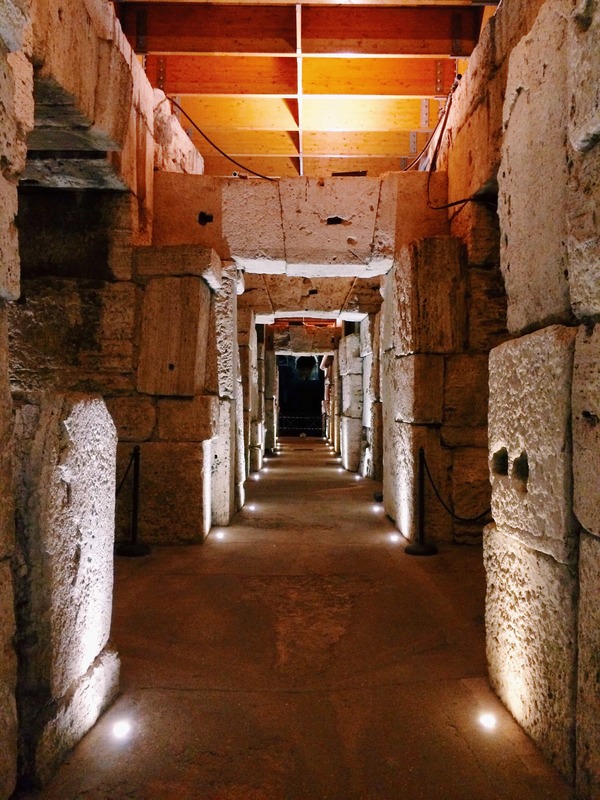 The exploration of the Colosseum continues with the thrilling access to the so-called hypogeum. 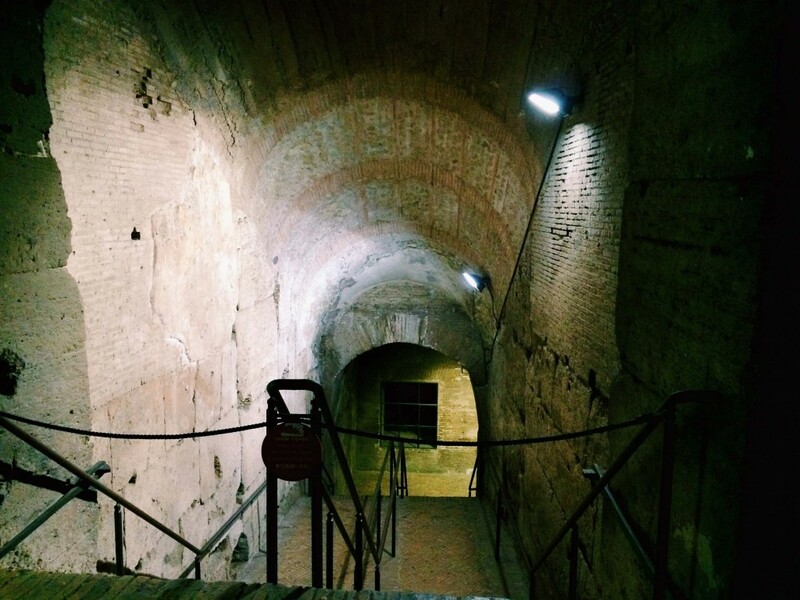 The underground spaces were organized in several cellars along fifteen corridors, parallel to the main gallery running along the major axis of the amphitheater ellipse. Restored several time during the Colosseum activity, the cellars were originally made of tuff and bricks and they served to the practical arrangement of the shows, also storing the necessary equipment and housing the cages for the animals. Walking through the corridors, from times to times enveloped in the darkness, and throwing light on the path at your best, you will arrive to the reconstruction of a goods-hoist, in place to illustrate how worked the swift moving of gladiators, animals and machineries from the underground level up to the trap doors on stage. The system of diversified goods-lifts moved by winches and supplied with ropes and ramps was based in fact below the level of the arena, both along the side corridors and in the middle cellars. This ingenious system contributed to the astonishing impact of the spectacles, assuring the copious flow of animals and gladiators as well as the quick changes of scenographic settings. To deepen the relationship between the 18th-19th century travelers and artists and the Colosseum by night, read: Nicola Moorby, ‘The Colosseum, Rome, by Moonlight 1819 by Joseph Mallord William Turner’, catalogue entry, October 2009, in David Blayney Brown (ed. ), J.M.W. Turner: Sketchbooks, Drawings and Watercolours, Tate Research Publication, December 2012, Online [accessed 09 October 2015]. 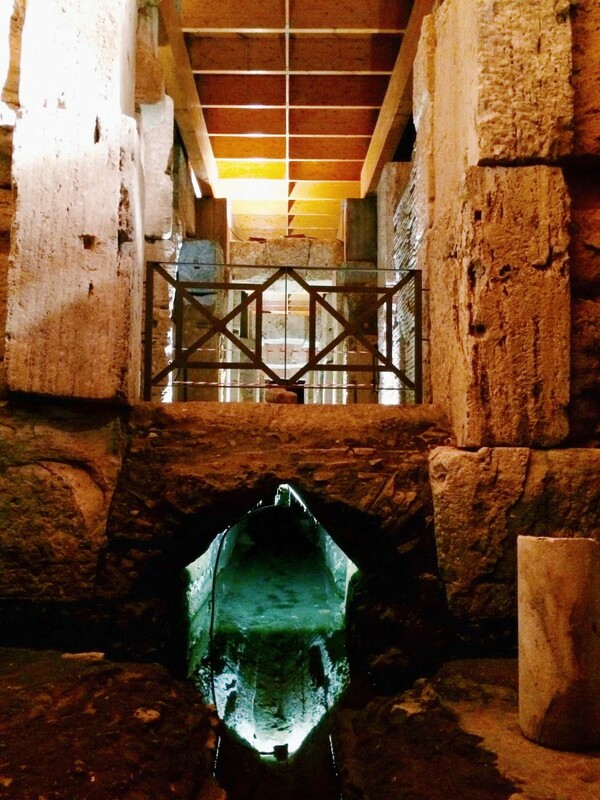 A water conduit belonging to the complex hydraulic structure of the Colosseum. 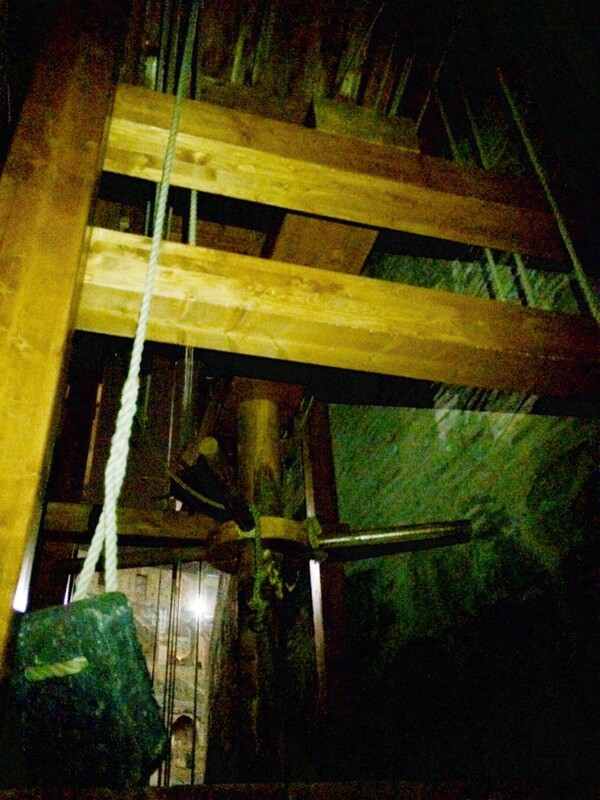 The reconstructed goods-hoist below the level of the arena. 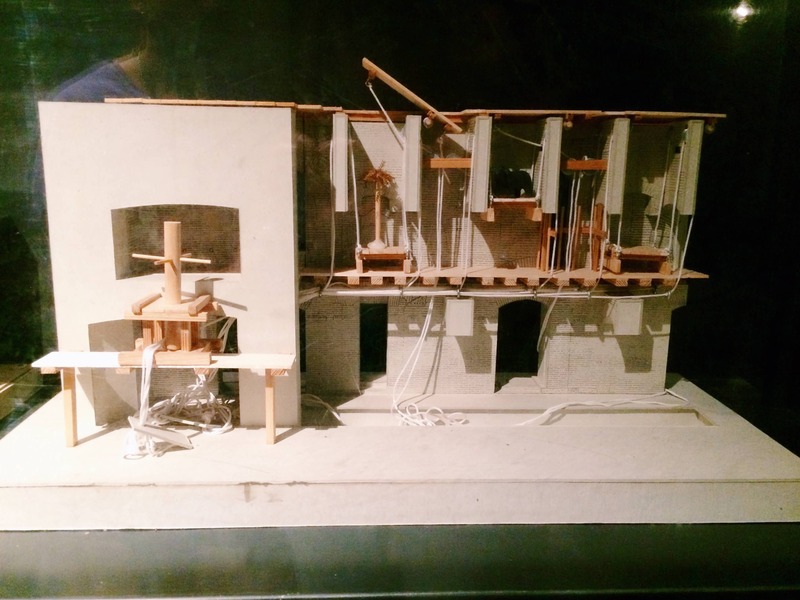 The scale model of a mural section with the reconstruction of the goods-hoists system. 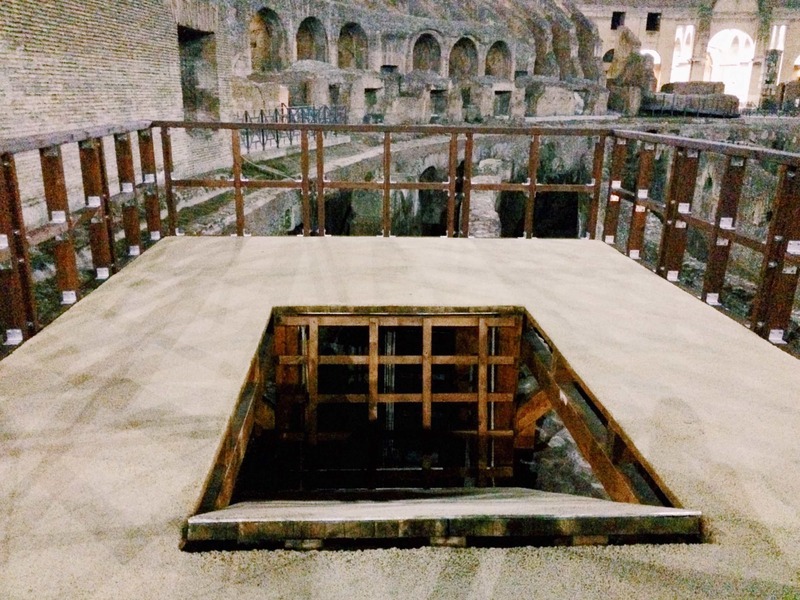 The trap door belonging to the reconstructed goods-hoist at the level of the arena. The interior of the Colosseum viewed from the second level of the amphitheater. Finally you’ll climb into the second level of the amphitheater and walk around its perimeter, from where you can admire the whole cavea in its entire splendor. 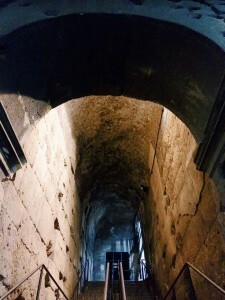 One of the stairways connecting the first and second levels inside the Colosseum. 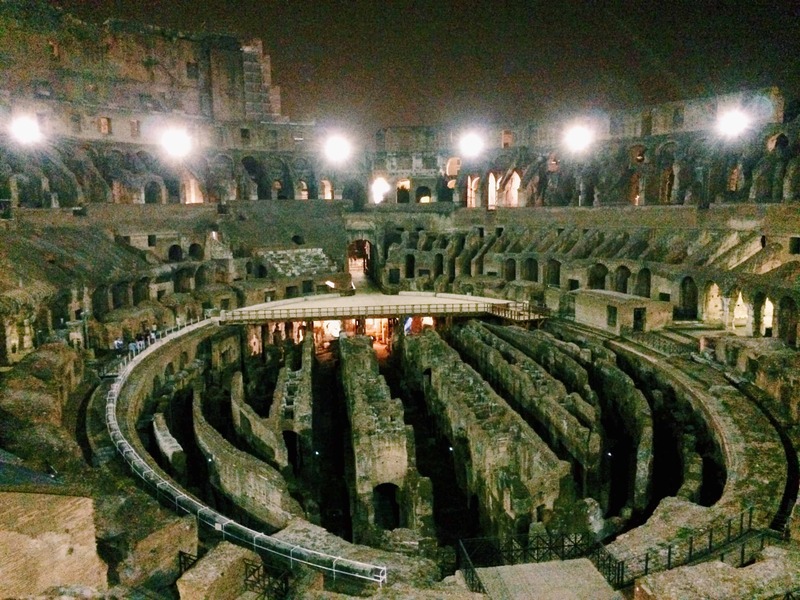 The evocative spectacle of the Colosseum itself has always fascinated travelers and artists, who expressed a predilection for the nocturnal contemplation of the ancient Roman ruins. Especially in the nineteenth century, foreign enthusiasts like Madame de Staël, Mariana Starke, Hugh Williams and Lord Byron wrote enchanted lines and artists like Turner and Carl Gustav Carus executed evocative depictions of the magnificent amphitheater by night. The innumerable open arches, with the moon beams shining through them, were like the eyes of past ages looking upon them. The stairway connecting the first and second levels inside the Colosseum. 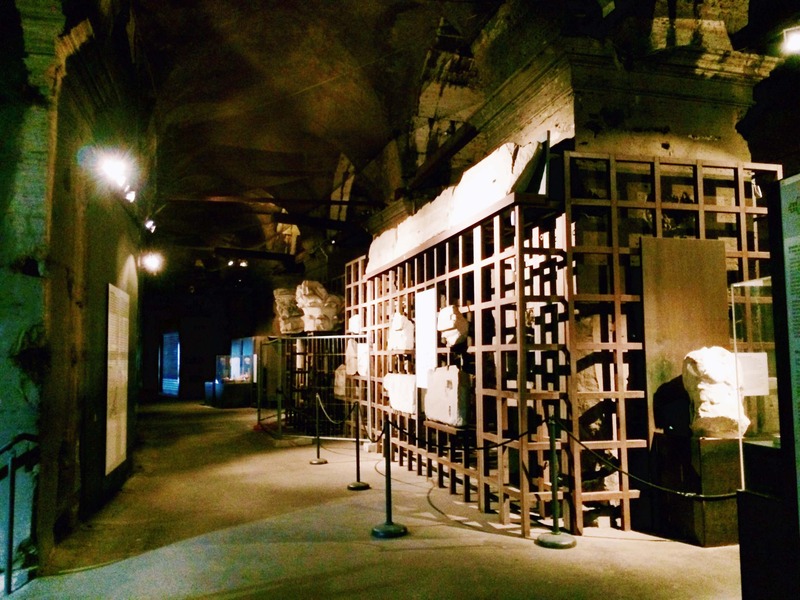 The permanent exhibition section at the second level of the Colosseum. Latin inscription dating to 1852 and dedicated by pope Pio IX to keep memory of the Christian martyrs and commemorate the restoration works performed on the monument. 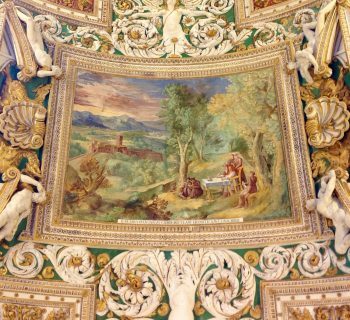 Once embellished with mosaics, marbles, murals and stucco decorations, the Colosseum suspended the entertainment of the Romans in the 6th century and changed its function and aspect several times. 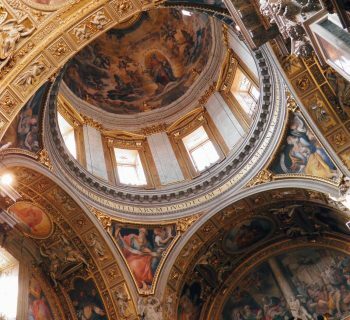 It was also reused as a huge materials deposit since the Middle Ages but thereafter it never lose its landmark importance as iconic monument, continuing to represent the highest reference for Renaissance and even Baroque architecture onwards. The Colosseum has never ceased to amaze and it still fiercely stands in mutual dialog within its city, as you will experience from a different perspective ascending on the belvedere Valadier. 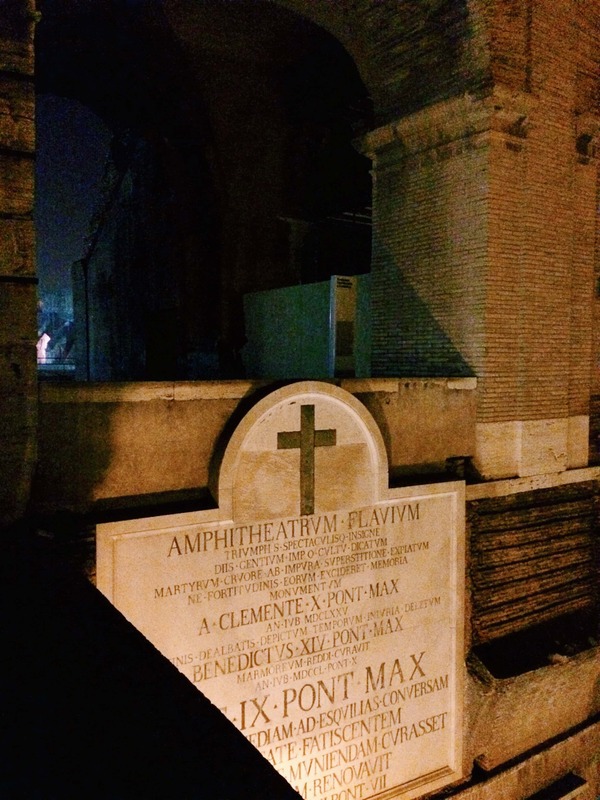 From there, you’ll embrace with your eyes the stunning scenery presented by the lively lights of Rome at night, interrupted by the shadows of the Palatine Hill. 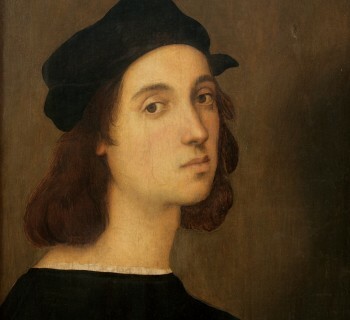 And you’ll stand speechless on the threshold between past and present, listening to the narrating silence of history. 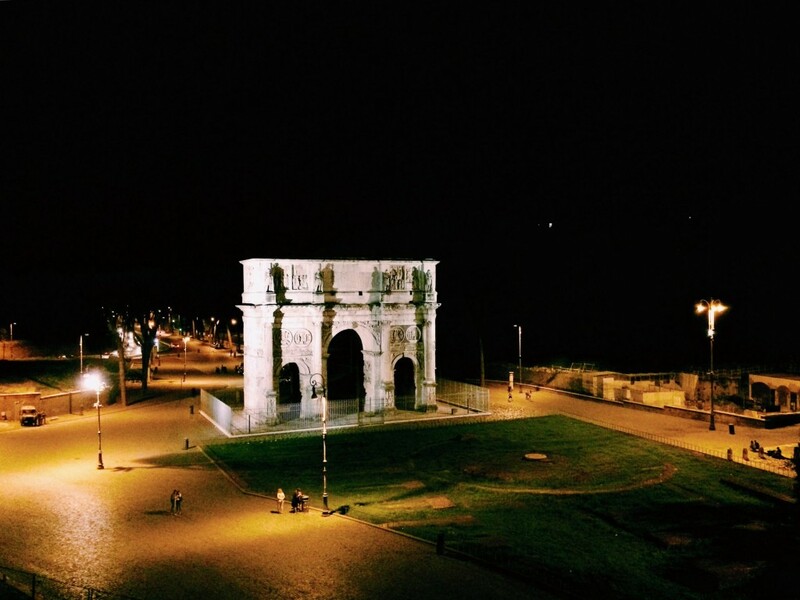 The spectacular view over the Arch of Constantine from the belvedere Valadier. This is not a sponsored post, we just payed the tickets for this tour as every common visitor.